Chromebooks are simple. They’re internet-computing distilled down to a platonic ideal of typing and looking and clicking and typing. And just as important (for my wallet), Chromebooks are cheap. You can find them for as little as $150. But which ones are any good? A keyboard that’s more than just passable. A Chromebook is, at least in part, for typing, but not all cheap laptop keyboards are decent. If typing is not a concern for you, I would suggest looking at tablets instead. A processor that can at least handle two or three web browser tabs with no problem. As a rule of thumb, multitasking on Chromebooks is not terribly doable. Part of their zen appeal is forcing yourself down into something more focused. But I’m not THAT zen. Battery life that didn’t leave me tethered to a wall. Bare minimum: 6 hours. 8 is better. There hasn’t been a Chromebook quite this impressive since the Google Pixel. Chromebooks are budget devices and that’s often represented in their cheap and plastic exteriors, garbage displays and obnoxiously bad keyboards. But the Asus Chromebook Flip is encased in aluminum, looks and feels like a nicer device, and has a nice display for its sub-$250 price tag. And its screen rotates so it can function as a tablet. The $330 Toshiba Chromebook 2 (the one version with the 1080p screen and 4GB of RAM) actually made me go “wow” right when I pulled it out of the box. My MacBook Air doesn’t have jack on the beautiful sunset this 1080p screen can deliver. Performance was good enough to handle the 4 or 5 tabs I always have open (Gmail, Tweetdeck, a few random websites), plus a few extra “read it later” tabs I collected over the course of the day. The keyboard is easy to type on, if not mind-blowing, and while the battery life is not exactly great, it gets the job done. I couldn’t quite make it through a workday, but a long movie plus a bunch of web browsing was definitely doable. Other than its screen, Toshiba’s Chromebook 2 is a jack of all trades and master of none, but in the Chromebook world that’s saying something. Every other Chromebook I used had at least one glaring Achilles’ heel, but the Chromebook 2 doesn’t. It’s a perfectly good device for anyone who’s just looking to browse the web and watch some Netflix. If you’re looking for a good keyboard to type up a novel at Starbucks, or hammering some entries into a spreadsheet on a business trip, I recommend the $380 (or $300) Acer Chromebook 13. The Chromebook 13 has a great keyboard—better than the Toshiba’s and worthy of a laptop three times the price. It’s also got great battery life: unlike the Toshiba, I was able to get it to hold out for a full 8-hour work day. It’s great for long-haul typing sessions, with occasional emailing or web-browsing inbetween. You know, your typical baseline work stuff. Still, the Chromebook 13 has a pretty gross matte screen; it looks grainy. Acer’s Chromebook might boast the same 1080p resolution, but I’d pick the Toshiba for watching movies or looking at photos any day of the week. Also, its guts are not fantastic. That Tegra K1 is really good at some stuff, like playing OpenGL games, but when it comes to just opening a bunch of tabs, the Chromebook 13 isn’t particularly special. That, and the high price stings compared to the competition unless you’re using it for the one thing it’s really good at: Long bouts of typing. There’s also a lower-price but still 1080p version for $300 that comes with half the RAM and half the storage. I can’t speak to the lower-RAM performance directly (though I imagine it’s fine for low tab-count work-type browsing), but I can say that local storage on a Chromebook is mostly worthless, so it’s probably a safe downgrade. If you want a Chromebook that can hop from room to room, but never actually leap into a backpack, get the $250 Acer Chromebook 15. It’s big, but that doesn’t matter if you never take it anywhere. The keyboard and trackpad are both excellent, and while that big screen doesn’t quite have the pop and color of a more expensive panel, there ain’t nothing wrong with it. The Acer Chromebook 15 isn’t a total powerhouse or anything, but its Intel Celeron processor is good enough to handle a dozen or so tabs at once without chugging. It’s a power bottleneck that isn’t likely to cramp your style too much. As an all-in-one, cheap, somewhat portable alternative to a desktop, it’s a solid choice. I’d recommend getting the more souped up $350 version with a 1080p screen and extra RAM—but know that even if you do, you won’t get quite the same movie-watching bliss as with the Toshiba Chromebook 2. Chromebooks have a reputation for being cheap, for better and for worse. The new Hisense Chromebook shows off the better. It’s only $150—exclusively at Walmart—yet it somehow has no insane fatal flaws. The keyboard is one of the best I’ve felt in in this price range, which isn’t saying much, but at least it’s better than those in Acer’s budget C720 Chromebook lineup. It’s easy, if not wonderful to type on. The screen is fine, but not beautiful, and the build quality is way more solid than I expected from something so cheap. There are catches. The Hisense Chromebook is not very powerful and it’ll start chugging once you get 5-6 tabs open, but it’s more than capable of handling necessary stuff like Tweetdeck and Facebook and Gmail and your favorite blogs — as long as you don’t open them all at once. The Hisense Chromebook is very much a $150 machine, but it’s the best you can get for that price. Google’s first $1,300 Chromebook Pixel was kind of a joke, but its $1,000 successor is actually a fantastic machine. It’s a pretty damn good choice if you spend almost every waking hour of your life working online (like me). Everything about this machine is damn near perfect. The keyboard and trackpad are immaculate. The screen is beautiful. With a high-powered laptop processor whose only responsibility is to run Chrome, the Pixel 2 screams. It has two charging ports, one on each side! I can’t overstate how great that is. The battery won’t last the day, but the USB Type-C charger is fast and compact. The catch with an expensive Chromebook is that it only runs Chrome, and you might want to consider the wide range of other laptops that run OS X and Windows if you’re willing to spend $1,000. But if you’re sold on Chrome, the Pixel 2 is the most polished Chromebook you can buy, even if the high price makes it tough to call it the best. This is one fantastic laptop. The former Best Overall couldn’t compete with the Asus Chromebook flip. Yet it’s still a high quality Chromebook for the price. The Acer C720 was the best-selling laptop on Amazon for a while. I can’t stand the keyboard. It’s glossy and shallow and my fingers slide off the keys. Typo city. Bad even for $200. Spend the extra $50 for an Asus. Ditto the keyboard problems. This version has the touchscreen going for it, which was fun for Angry Birds and potentially if Google ever optimizes Chrome OS for touch in the future. For now it’s not worth it. This little sucker screams. Same annoying keyboard, but it blows just about every other Chromebook away performance wise. But with ChromeOS, that’s not worth a whole lot; it’s a luxury rarely worth the money, especially with the sub-par keyboard. Nice, durable little clamshell with solid build quality, a good enough screen, and a solid keyboard. But the poor performance is unforgivable. I can’t even type in a search query without horrendous lag. Lenovo’s N20p is a touchscreen Chromebook and the first to be a convertible, but it only backflips 300 degrees to “tent” mode. that’s not cool enough of a trick to save it from its recessed keyboard with a ridge that makes the spacebar near impossible to hit reliably. Haier Chromebook 11: Pretty much identical internally to the Hisense Chromebook for the same $150, but feels even cheaper. Claims to have longer battery life, though. We’ll try to test it, but can’t recommend it yet. HP Chromebook 11 and 14: About to be made obsolete by HP’s upcoming crop. I’ll check out the successors as soon as they hit store shelves. Samsung Chromebook 2 (13-inch with Exynos): It’s got a nice screen, on par with the Toshiba Chromebook 2. But the Exynos processor in this 1080p model just isn’t up to snuff. Lenovo Thinkpad Yoga e11 Chrome: Specs are average, reviews are middling, price is inexplicably high. Lenovo Thinkpad e11 Chrome: No backflipping and $100 cheaper, but not much more better than the Yoga version. Lenovo N20: Cheaper and simpler than the convertable N20p, but still suffers from the same iffy keyboard. Chromebook Pixel: $1,300? lol no. 2/6/15 - Dell Chromebook 11 named Best Overall after becoming available again. Toshiba Chromebook 2 named Best for Watching Movies. 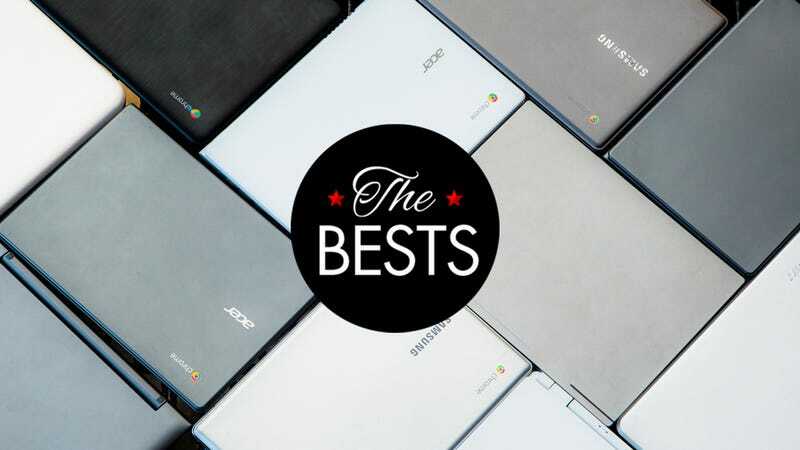 4/20/15 - Hisense Chromebook named Best Budget Chromebook, Acer Chromebook 15 named Best Big Chromebook, Chromebook Pixel 2 named Best Chromebook for Internet Workers. Acer C200, C300, Haier Chromebook 11, and Asus Chromebook Flip added to The Rest. Added warning about Dell Chromebook 11 for Education. It’s not the same laptop!